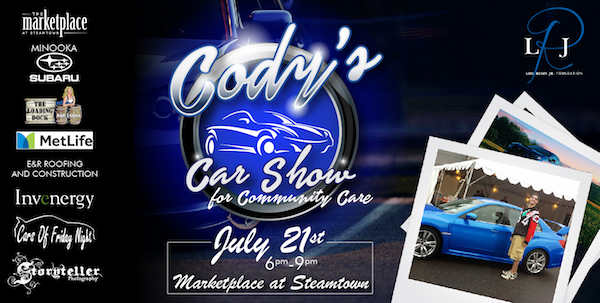 Join us at the 2nd Annual Cody Car Show, hosted by The Friends and Family of Cody Wood and Cars of Friday Night on Saturday, July 21 from 6-9pm. The event will benefit LRJ Foundation’s Mental Health & Wellness school-based and community programs. The car show will be held at the Marketplace at Streamtown parking garage. Four floors filled with cars!! Car entrance fee is $10 and is 100% tax deductible. Spectators can enter for FREE. All car styles, types, and models welcome. There will be lots of food, raffles and entertainment paired with awesome prizes and cars. A summer Saturday evening full of action for a great cause. Pre-register your vehicle by July 19th to be entered into a drawing for the chance to win a $100 Amazon Gift Card!